Much of chemistry is motivated by asking 'How'? How do I make a primary alcohol? React a Grignard reagent with formaldehyde. Physical chemistry is motivated by asking 'Why'? The Grignard reagent and formaldehyde follow a molecular dance known as a reaction mechanism in which stronger bonds are made at the expense of weaker bonds. If you are interested in asking 'why' and not just 'how', then you need to understand physical chemistry. Physical Chemistry: How Chemistry Works takes a fresh approach to teaching in physical chemistry. This modern textbook is designed to excite and engage undergraduate chemistry students and prepare them for how they will employ physical chemistry in real life. The student-friendly approach and practical, contemporary examples facilitate an understanding of the physical chemical aspects of any system, allowing students of inorganic chemistry, organic chemistry, analytical chemistry and biochemistry to be fluent in the essentials of physical chemistry in order to understand synthesis, intermolecular interactions and materials properties. 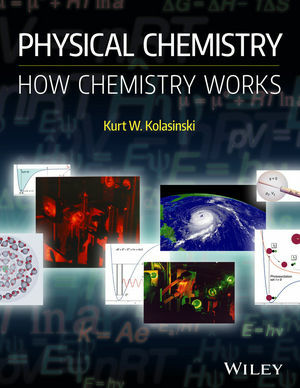 For students who are deeply interested in the subject of physical chemistry, the textbook facilitates further study by connecting them to the frontiers of research. Provides students with the physical and mathematical machinery to understand the physical chemical aspects of any system. Integrates regular examples drawn from the literature, from contemporary issues and research, to engage students with relevant and illustrative details. Important topics are introduced and returned to in later chapters: key concepts are reinforced and discussed in more depth as students acquire more tools. Chapters begin with a preview of important concepts and conclude with a summary of important equations. Each chapter includes worked examples and exercises: discussion questions, simple equation manipulation questions, and problem-solving exercises. Accompanied by supplementary online material: worked examples for students and a solutions manual for instructors. Written by an experienced instructor, researcher and author in physical chemistry, with a voice and perspective that is pedagogical and engaging. Kurt Kolasinski has been a Professor of physical chemistry at West Chester University since 2014 having joined the faculty in 2006. He has held faculty positions at the University of Virginia (2004 - 2006), Queen Mary University of London (2001 - 2004), and the University of Birmingham (UK) (1995 - 2001). His research focuses on surface science, laser/surface interactions and nanoscience. A particular area of expertise is the formation of nanostructures in silicon and porous silicon using a variety of chemical and laser-based techniques. He is the author of over 100 scholarly publications as well as the widely used textbook Surface Science: Foundations of Catalysis and Nanoscience, which appeared in its third edition in 2012.